The Moonachie First Aid & Rescue Squad would like to thank every one for all the help and support we have been receiving over the past few years. With out the help of the community we would never be able to come back from this terrible disaster. We encourage every one to continue the support we are here to serve the community but can't do it alone. Please HELP US, HELP YOU. We are currently making great progress toward our $500,000 goal. Which will help with replacing lost equipment and rebuilding our headquarters and bringing it up to date with all the necessary improvements needed. Monetary donations are always welcome, ways to donate are listed below. The Moonachie First Aid & Rescue Squad would like to thank the Bama Works Sandy Relief Found created by The Dave Matthews Band and especially Ms. Ann Kingston and Faith Kruger of Red Light Management along with the Community Foundation of New Jersey for their donation of $20,000 to help with rebuilding from the storm. This donation and so many others like it continue to bring us closer to our $500,000 goal, which will allow us to complete a much need expansion and renovation of our current building. Over time our department has out grown itself and with your continued support, we will only continue to get bigger and stronger. With the expansion we are hoping to add to our tiny one floor building, we would like to add a second floor in order to eliminate a disaster like this affecting us again in the future. 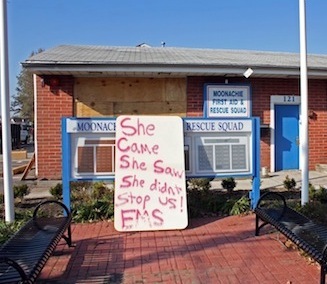 The Moonachie First Aid & Rescue Squad was dealt a terrible blow in the wake of hurricane Sandy. During the height of the storm the town of Moonachie was flooded with up to 6 feet of water in a matter of minutes. With no warning or time to plan, the department was forced to do what they do best and spring into action leaving behind equipment, tools, and most of all our personal belongings. The department worked hours on hours helping the residents to safety while trying themselves to simply stay safe. Many members lost personal belongings including cars or their own homes, but never once turned away from the mission at hand; keeping the same dedication that made the department what it is known to be, a Squad that hasn't missed a single call for help in over 12 years. It is now time that the Moonachie First Aid & Rescue Squad asks for your help in rebuilding. Moonachie First Aid and Rescue Squad is a non profit volunteer organization. The Squad is dedicated to providing First aid, rescue, and rehab to the borough of Moonachie, its residents and businesses. The Squad also provides these services to surrounding towns when the need arrises. We are very proud to announce that we have provided this professional and timely care for over a decade with out missing a call. The squad consists of over 40 members operate six specialty vehicles, one amphibious vehicle, one John Deere Gator, one zodiac rescue boat, and two flat bottom boats all of which are equipped with first aid and rescue supplies.